The Nose: Sweet, definitely an old-apple/fermentation sort of smell. It’s rather lovely in an unusual way. It smells like raking leaves in the fall. You know, when they’re just starting to decompose and there’s like, some dew or rain or something, and the leaves give off a light, sweet scent along with the heavy, earthy smell of fermentation and decomposition… Is that a thing? Is this just me? I don’t mean that I’m the one who gives off that smell. I’m just wondering if I’m the only one who’s smelled it and interpreted it thusly. The Packaging: I kind of like it. I’m not really sure what’s going on… but I like it. I like the colour scheme (black, antique gold, and white). I like the stylized mountains around the top near the rim. Everything about it is well-balanced and appealing. It looks good. I’m just a little confused by the hodgepodge (or hog-podge?) of the simple, elegant colour-scheme paired with antique-y, elegant fonts and then the addition of bold, edgy fonts with a biker pig in the middle. The Mouthfeel: Nice carbonation off the top, but it almost immediately falls away. Luckily the cider isn’t as heavy as it looks, so the lack of carbonation isn’t a huge issue. It does leave my tongue feeling a little coated though. The Taste: Sweet. It isn’t particularly apple-y (although I’m about half-way through at this point, and my taste buds might be compromised due to aforementioned coating.) The flavour tapers off quickly. I can’t really detect any nuances. The Verdict: I don’t not like it. It’s nice. It’s good. It’s easy-drinking. It’s a little heavy but, that being said, it’s still innocuous enough to have multiples. I feel like the can is more nuanced than the cider itself, though. It looks like they’re trying to marry tradition with like, contemporary edge… but they didn’t do anything edgy with the cider. I digress. Unlike others, I’m happy to have some left in my fridge: 6/10. This entry was posted in Cider Review and tagged Apple Cider, Canada, Canadian Cider, Cider, Cider Review, Hard Cider, Vancouver. Bookmark the permalink. Two words….. Not good. Don’t drink. It’s terrible. If you are looking for a cheap champagne taste, nailed it. 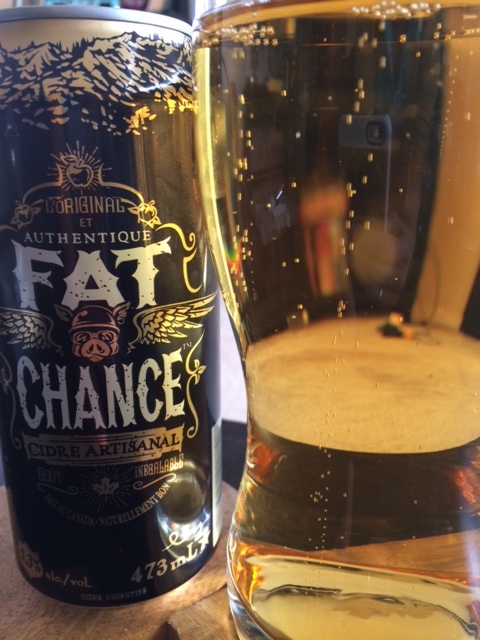 Sorry for being so harsh FAT CHANCE but it is not a quality cider and I would not purchase your product again. 10… well that is as subjective as it gets. People seem to compare cider in rather funny ways. Colour? Who cares? As long as the colour came from the bloody apples. This has a firm taste of apple. I am sick of that “flavoured” quality. I want something that tastes like they let some microbes have there way on juice in a barrel. Coating? I wish it had more. I am still looking for a cider to put hair on your hair! This beats the pants off a lot of the mass-produced stuff out there. But don’t listen to me, and absolutely do not listen to the “snobs” talking about ‘mouth feel’ and useless nonsensical buzz-words… Drink what you like to put in your mouth hole! This was a nice easy cider, that felt like it was not trying to be anything more than an apple cider. It’s not the second coming of fermented juice, but this is no ‘6’. It’s a little sweet, and a little tart, (hell I’d even agree with “cheap champagne”; but I think that’s the point”)… for me I’ll call it a 7-ish… It is good, it is “Not bad”. And better than a lot out there. For an apple cider, I’d get this again. Fat Chance “tastes natural” that’s because it contains “natural flavour”! Nowhere on the label does it even say what fruit it is made from. I kid you not. The ingredients listed are “cider (? ), natural flavour and carbonated water. Meanwhile, William cider from Quebec lists “organic apples” as it’s sole ingredient. That actually is “raw and real”, not Chemically constructed flavourings added to presumably some kind of fruit cider that then suggest it to your tastebuds.